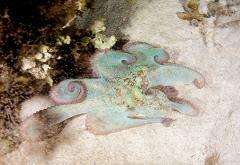 Let us take you out to The Great Blue Hole and the stunning walls of Lighthouse Atoll. A truly epic day trip, this 3 dive tour is sure to impress as one of the best diving experiences in the Caribbean and the entire world! 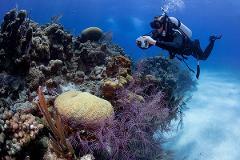 When it comes to diving off Belize's Barrier Reef, it doesn't get much better than the San Pedro area. This tour is about 35 minutes away, and offers amazing coral canyons and a high chance of seeing Nurse sharks, Grouper and Moray Eels. Only a 15 minute boat ride away, Caye Caulker Marine Reserve offers excellent reef diving and an awesome surface interval, where you can choose to snorkel! 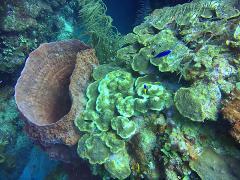 It's a great trip for spotting smaller marine life nestled in hard and soft coral. Remote, scenic, and covered in healthy coral. Spanish Bay is an hour's boat ride away over the calm waters behind our barrier reef. 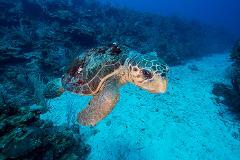 This trip includes lunch, 2 dives, & an excellent chance of seeing anything from Eagle Rays to Sea turtles. 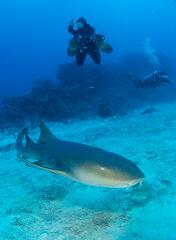 Night dives are offered to Coral Gardens, Tuesdays and Saturdays, 5 pm departure, 1 tank, 2 hours long. 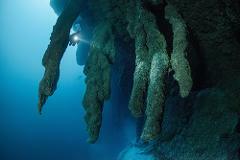 Beneath the islands of the Northern Great Barrier reef are some of the Carribean's most hidden jewels. 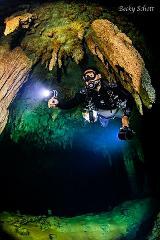 Guided cave dives of Giant Cave and Winter Wonderland area available for certified Intro to Cave and Cave Divers.